National senior Olympians Gene and Lei Bammel qualified (to qualify one must win gold or silver in a state tournament) last year to play in the nationals. For the past six summers, they have trained at Aria in Vail. 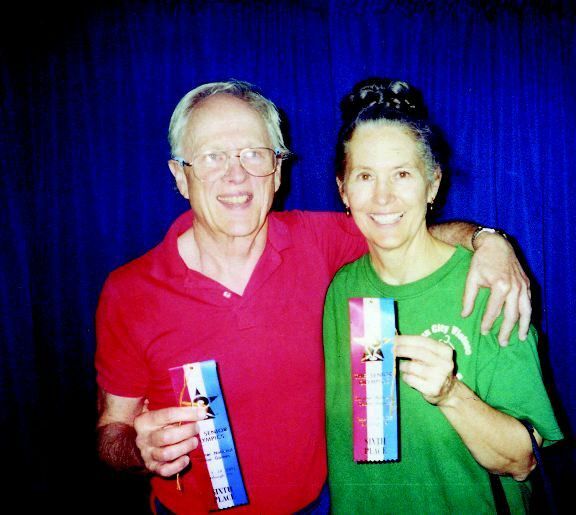 In June at nationals in Pittsburgh, they placed sixth in mixed doubles. Lei and her doubles partner, Leslie Esparza, won bronze, and Lei got an eighth-place ribbon in singles. While many of us are trying to help victims of Hurricane Katrina, a couple in Eagle lost everything they had earlier this year. They’re trying to rebuild their lives, too.Dan and Dawn Horner lived in a mobile home in Eagle. Earlier this summer, the home caught fire because of an electrical short. The place was a total loss. The Horners bought a new home and can move it into the park they’re living in, but they still need some help with furniture, new carpet, and everything from bed sheets to pots and pans.To help by contributing stuff, or helping with work on their new mobile home, please call 970-945-7451.Thanks. Give MS the BootThe Dusty Boot in Beaver Creek is holding a tasty fund-raiser for The Heuga Center. Today only, the Boot will donate all the money people spend on lunch and dinner to The Heuga Center, and will match that amount.Besides a delicious meal, diners will be eligible for door prizes including lodging, ski and snowboard equipment and clothing gift certificates. Do you have a good story to tell about something that happened on an ECO bus?ECO Transit, the county’s bus agency, is looking for good bus stories of 500 words or fewer. Winners are treated to a weekend getaway at the Hotel Monaco in Denver, courtesy of KZYR the Zephyr. Winning stories may be read on the air during ECO Transit’s Try Transit Week, Nov. 14-18. E-mail stories are preferred, but pencil and paper work fine, too, and stories written in Spanish are welcome. Stories must be rated G.
All entries must include the writer’s name, telephone number, e-mail address and mailing address.Send stories to ECO Transit by Sept. 23. Call 328-3520 or e-mail eco@eaglecounty.us for more information.For more information about ECO Transit, visit the Eagle County web site, http://www.eaglecounty.us.